Support Modi’s Swachh Bharat Abhiyan - India’s First Green Village! Situated on a cliff, overlooking the undulating movements of the rice fields, Khonoma is a small village in the interiors of Nagaland that is home to the indigenous Angami Naga warriors. 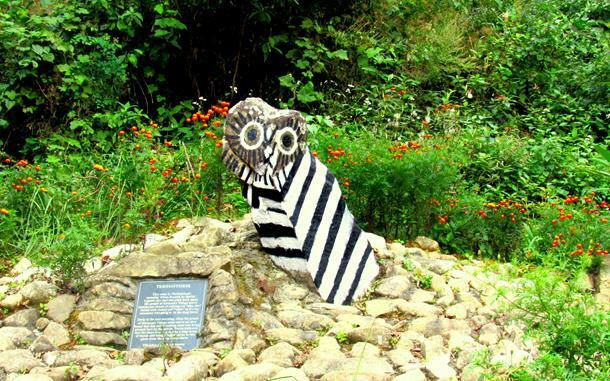 A rickety-rockety ride though the sinuous 20 km road from Kohima leads you to Khonoma - India’s First Green Village. The drive is sub-alpine and exposes a diabolic view of the breathtaking abyss down under. A quaint little village whose soul was marred by war several times in history, today Khonoma has emerged like a phoenix fighting scores of bellicose battles since 1850. 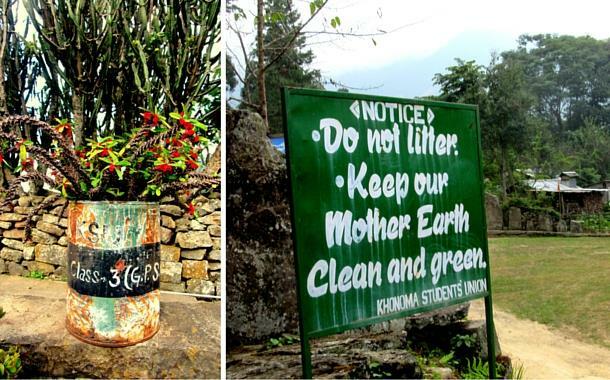 Khonoma’s journey to becoming the very First Indian Green Village began long before Modiji’s Swachh Bharat Abhiyan. In 1998, the 20 sq. km. area was declared as Khonoma Nature Conservation And Tragopan Sanctuary (KNCTS). Now, hunting is banned not only in this area, but also the entire expanse of village sprawling over 125 sq. kms. Khonoma has also adopted a Slash-And-Burn Farming or Jhum Cultivation method, where the forestlands are cleared for the purpose of agriculture. Regarded as India’s First Green Village, it has adopted an environmentally conducive living by banning the age-old Naga tradition of hunting - a move worth emulating throughout Nagaland as hunting is second-nature to the Angamis. Another amazing part of this village is that the Khonoma Students’ Union is super-active in environment preservation and strives hard to maintain its image of India’s First Green Village. It is the kids from class 1 and above, that actually maintain its reputation. It is really inspiring to see such a change because the native inhabitants of Nagaland devour anything that moves - from eels, larvae to elephants, birds, absolutely everything. In fact, the first thing that crosses a Naga-mind when they see an animal or bird, is how it will taste. 1. A small stroll in the village, and you will spot an empty tombstone, as if the ghost has resurrected itself and walked out of its grave. This thought can actually give you nightmares. A gravestone lays sunken in stone walls, alone and desolate. Besides it, you will see an outline of stones, a bespoke mark that these stones were displaced. 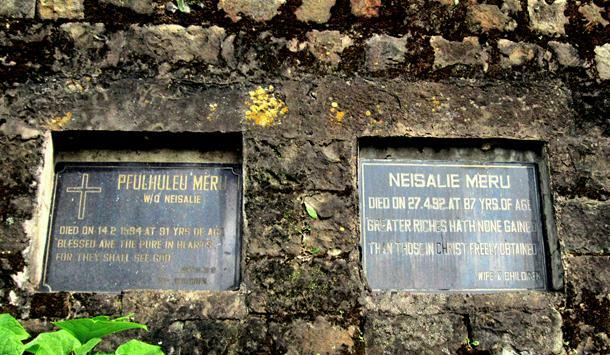 According to the Angami tradition, when a married elder in the family dies, its grave is set in walls of the stone. The space besides it is reserved for the spouse’s grave. The idea behind it is that the couple stays together even after death - forever and ever after, even death can’t do them apart. This is how the couples rest in peace, besides each other in their grave. This is the mother of all ‘love is immortal’ anecdotes. A terrific example set by a small village, love is definitely not a pre-historic term. It is sweet and spooky at the same time, isn’t it? Does watching your own grave while you are alive scare the hell out if you? 2. 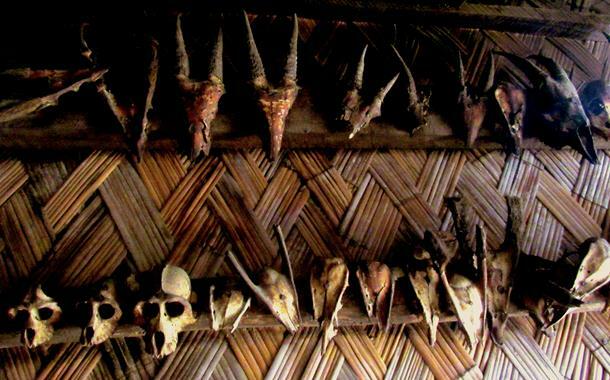 Some of the houses still exhibit trophies from their past headhunting kills - skulls of bison, deer, monkeys, elephant tusks et al, still adorn their house entrances. A stroll through the village will lead to umpteen revelations. As eerie as it may get, but they were once considered a symbol of power. 3. 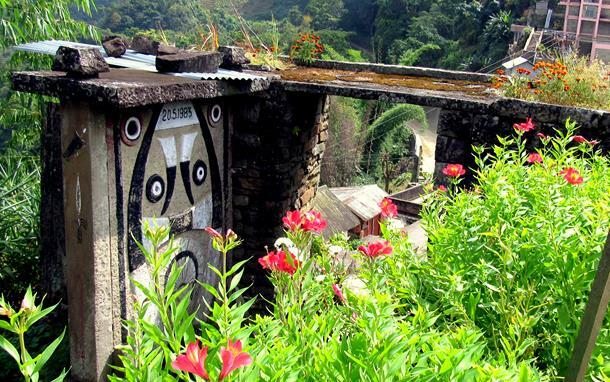 Bang opposite a Baptist Church, a flight of rock-hewn steps take you into the interiors of Khonoma. A traditional stone door, called ‘kharu’ welcomes you to this village; oblivion to the fact that it is a gateway to a horde of epiphanies of the Naga tradition. 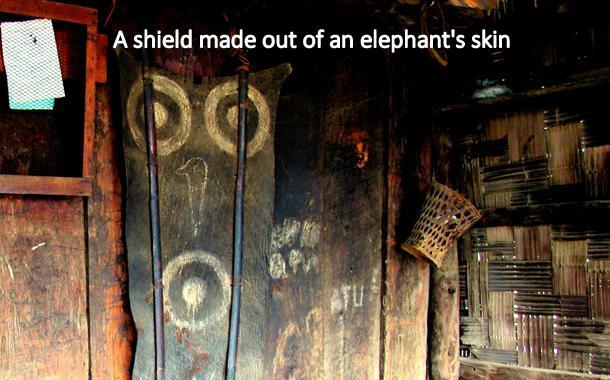 From the chivalrous stories of the Naga warriors to the fabled tales of the headhunters who single-handedly savaged many a beasts, this place holds a lot of secrets. 4. Dotted by small houses on either side of the cliff, a 190-year old fort straddles at the edge of the cliff - an eyrie that sits silently like a damsel that was once in distress. 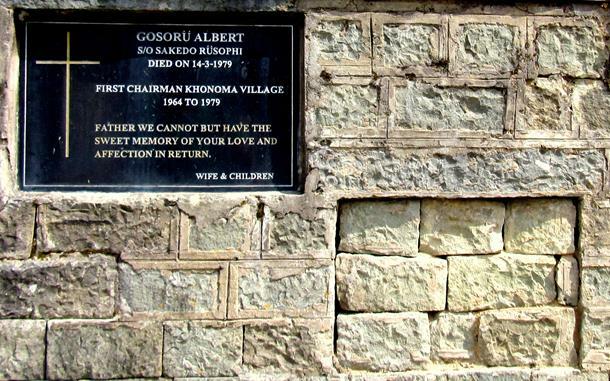 The walls of the fort are hard to miss - they are built of stones and impregnate a marble plaque that read the following. 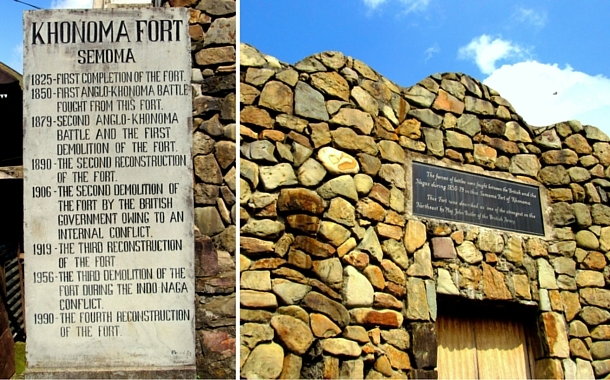 “The fiercest of battles were fought between the British and the Nagas from 1850-79 in this Semoma Fort of Khonoma. There’s nothing left of the fort; a stone plaque gives a brief history of the fort. The literature on the stone stands testimony to the century-old transformation that Khonoma went through. 5. 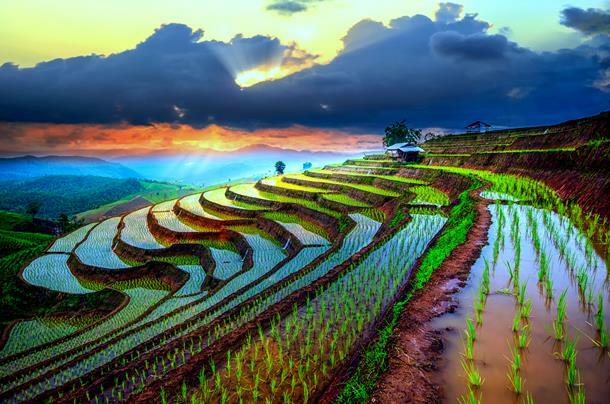 You don’t have to visit Bali or Vietnam to see the terraced rice fields. From Khonoma Fort’s vantage point, you will be enthralled to see the viridescent landscape filled with layers of paddy. 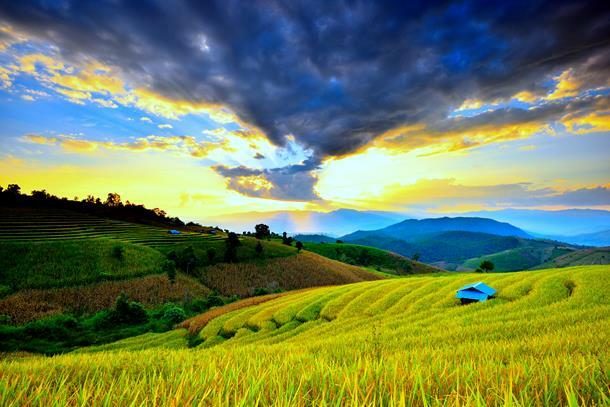 Long strands of paddy waltz to the gentle zephyr; terraced rice fields form a verdant staircase and birds chirp their way into the lapis lazuli of the horizon. 6. Throughout the village, you will pass through gravestones with epitaphs written on them. A queasy feeling of uneasiness slips into your body just as you realise that, although the fire has extinguished, it has left a few embers floating in the air and its pain and agony can never be washed away. 7. A further deeper into the village, you will see a traditional ‘morung’, a place where young Naga boys learn about their traditions. Outside the morung, there are hung guns, the look of it is enough to scare the living daylights out of you. Weapons and daily use equipments made out of animal pelts, wood and hay hung on the wall form a montage of their legacy, a legacy that is not completely gone, but lays silenced by modernisation. 8. A sinister looking owl garbed in a salt-pepper look is said to have been erected by the spirits. 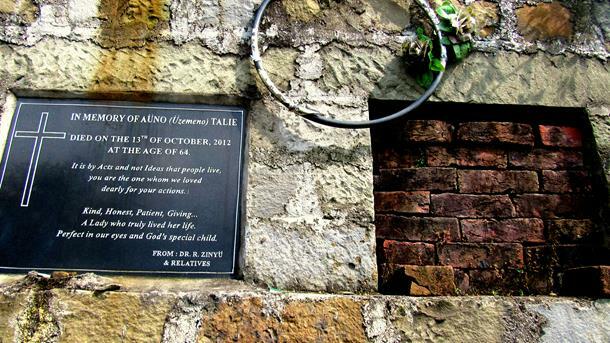 Called as ‘Terhouotsiese’, meaning ‘stone erected by the spirits’, it is home to an outrageously spine-chilling legend. “One pitch-dark night, the people of Khonoma village heard thunderous shouts of rallying cry “oho, oho”, dotted with victory yell “alulu” as if a big ceremony was going on in the deep forest. Air: The nearest airport is the Dimapur Airport. The connectivity of flights may be low and it could also be costly, yet this is a time-saving option. If you have time on your hands, then a wiser option is buy a flight ticket to Guwahati in Assam and take an overnight bus to Kohima, from where it is another 20 kms. Rail: The nearest railhead serving the area is Dimapur Railway Station. Though your train may not be directly going through Dimapur, you may alight at Guwahati (which is well connected to rest of India) and board a connecting train to Dimapur. 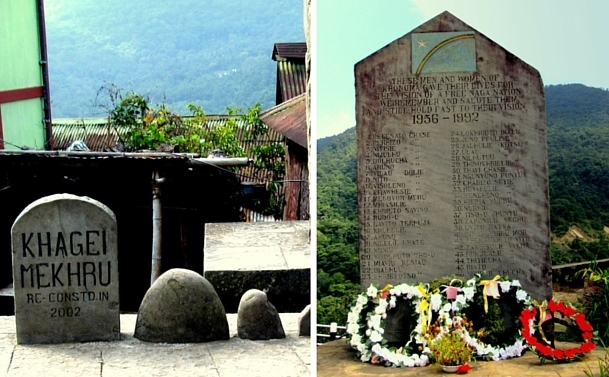 Road: Kohima is the hub-destination for Khonoma. Once you reach Kohima (by road or rail) you can hire a cab to Khonoma. Before embarking your excursion to Nagaland, you are required to take a permit. Domestic tourists need to obtain the Inner Line Permit issued by the following authorities - Deputy Resident Commissioner, Nagaland House, New Delhi, Deputy Resident Commissioner, Nagaland House, Kolkota, Assistant Resident Commissioner In Guwahati and Shillong, Deputy Commissioner of Dimapur, Kohima and Mokokchung. Foreign tourists no longer require a Restricted Area Permit (RAP) / Protected Area Permit (PAP) to enter Nagaland. The new rules only require foreigners to register themselves at the local Foreigners Registration Officer (FRO) of the district they visit within 24 hours of their arrival. This is a temporary change in effect for one year.